Here's a little background info: Faye and I were best friends in middle school. We both attended Bitburg Middle School in Germany, where our dad's were stationed with the Air Force. We shared a love for the Gap (Um, can you say matching capris and scarves? ), freshly doodled notes, and LL Bean Boat & Totes (I'm pretty sure we were one of the few teens in 7th grade with monogrammed canvas bags). She's so dear to me. The time we got to spend together makes me smile to this day. She's been a great friend, and I'm so glad we've been able to keep in touch. Toodles, Doodles, Gobbies (the way we'd end each note)! 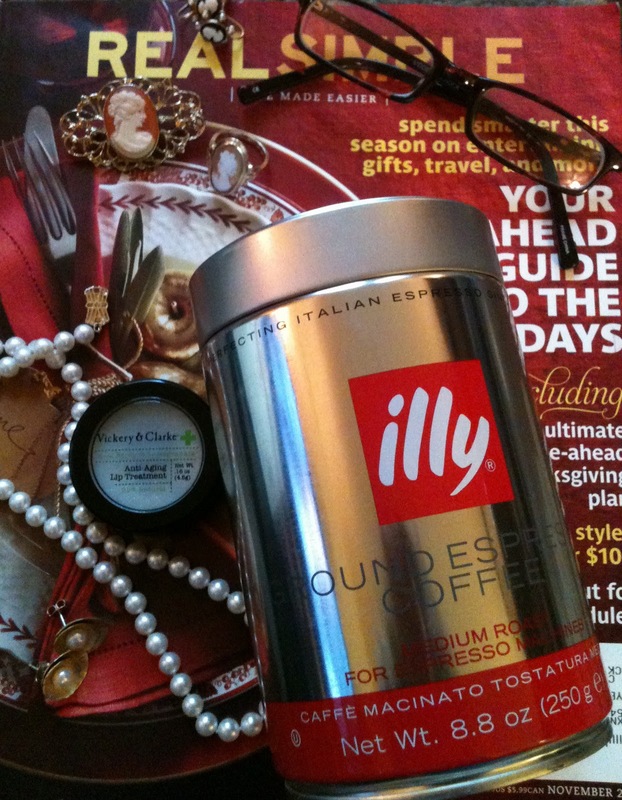 illy Coffee...World's BEST coffee that I sometimes allow my self to splurge on. My Mutti's Cameo Ring -- I adore! Cameo Earrings -- Recently purchased for $5 at an antique store. My newest favorite thing -- my eyeglasses purchased at justeyewear.com, a great low-cost prescription glasses Website I highly recommend. I wish we could chat about the November Real Simple and drink a cup of illy coffee together. I love these vignettes so much - it's crazy how you can totally envision someone's style by seeing a snapshot of a few of their things. Great series! I too love Illy and Real Simple. What a great combo for a lazy Saturday morning right? Love your new header too! Have a great week. It's so cool to do something like this and to see what everyone chooses to submit! I guess I'm always amazed at how much so many of us have in common. You really can tell a lot about the different personalities. Thanks for the comments:) You guys made my day. Hope you all are having a wonderful weekend! !